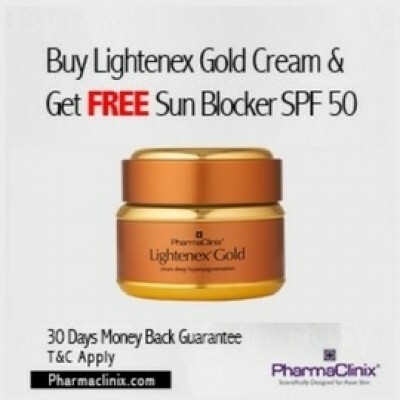 Lightenex® Gold cream is the strongest skin whitening cream to treat hyperpigmentation and melasma in Asian, African & Ethnic skins, without the use of Hydroquinone. Lightenex® Gold cream reduces pigmentation, as it contains professional strength Actives including Alpha Arbutin, Beta Arbutin, Vitamin C, Octadnoic acid, Niacinamide, L-Lactic acid, Retinaldehyde, Glucosamine, Salicylic acid, Liquorice exrract, Vitamin E.
Independent trials have shown up to 80% reduction in melanin level over 12 week period. Apply two hours before going to bed on cleansed face. Massage until fully absorbed. It is essential to wear Sun Blockex® SPF 50 during the day to prevent the harmful UVA & UVB rays from darkening the skin. Monthly photographs for objective measurement of improvement. Superficial redness & flacking is normal & will subside in a week. Disclaimer : ‘Results are not guaranteed and may vary in every individual’.